The brain-child of Willie Patterson, local sailing enthusiast and Past Commodore of Annandale Sailing Club. 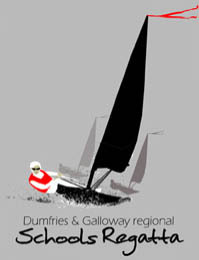 He has been member of two of the most active sailing clubs in Dumfries & Galloway for many years. The Solway Yacht Club but also of the club, without which The Five Castles Regatta, previously known as the South West Scotland Schools Regatta, may never have got off the ground, Annandale Sailing Club. It was however Willies idea and as with any great idea it takes someone with a clear vision to make it happen. In a nut shell this regatta was brought into being for one reason, to get kids out on the water enjoying themselves and that is exactly what it has been proven to do. It was first held at Annandale Sailing Club on the Castle Loch hence the named shield for the winners of the team racing regatta. Annandale Sailing Club remains one of the driving forces behind the event with large numbers of the membership giving their time freely to the organisation and running of the Five Castles Regatta. The committee were far sighted enough to understand a more central and adaptable location might be more suitable as more schools joined in and the numbers of young people taking part grew exponentially. 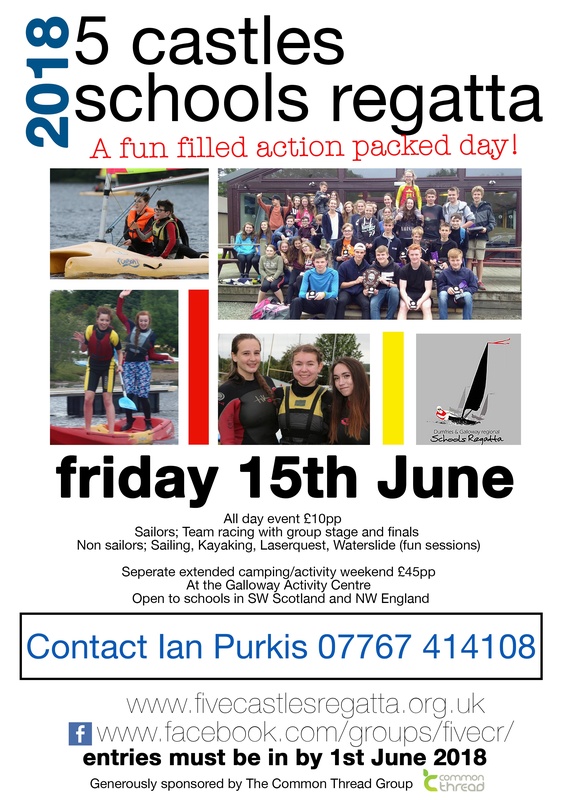 This has been san excellent decision as since the Five castles Regatta moved to The Galloway Activity Centre on Loch Ken it has grown into a very large event indeed certainly one of the largest youth sailing events run outside the auspices of the RYA in Scotland. In 2010 well over 100 young people were involved. All the organisations involved providing venue, equipment and personnel do so on an entirely not for profit basis. All personnel involved are highly experienced, competent and RYA qualified. What started primarily as a sailing event now provides the opportunity for young people to enjoy the outdoors in more than one way. Whilst the racing may well be seen as the 'blue riband' event of the day. The fun activity part of the day has a very large part to play in giving those young people who have no knowledge of sailing or other water sports a brilliant opportunity to enjoy the outdoors, on water in a safe and controlled environment with the highly trained instructors from the activity centre. The young people taking part in this aspect of the event have the opportunity to win "The Spirt Trophy" donated by Common Thread Ltd. one of our sponsors for the young person or group of young people that have shown themselves to be outstanding in their interactions and enthusiasm over the day. The event has helped immeasurably to promote and develop sailing in the south west of Scotland we absolutely intend to increase the numbers where possible to reach children from all walks of life and all areas within the south of Scotland and beyond.